Ah, the smell of the greasepaint, the roar of the crowd the sense of fame and achievement.…… or should that be the whiff of the back of the village hall, performers squashed into a small green room and the shuffle of friends and family members sitting outside in rows quaffing the local beer? When thinking about a blog for this month I was drawn to what the differences are between being part of an am dram group verses being a professional actor and what are the similarities. Well, I believe that the boundaries are nowadays quite gray in some regards and with the boom in am dram groups and the professionalism and performances put in by “amateurs” can be on par with the majority of trained actors and actresses being paid to perform. Latest statistics tell me that there are more than 2,500 am dram groups in the UK, putting on an unbelievable 30,000 productions every year. 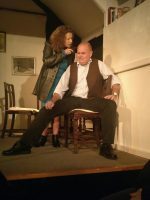 Am dram is not something that is confined to a small group of select arty farty type individuals, it is now something that is present in all parts of the country and attracts everything from local farmers to city lawyers. So what is a professional actor? A professional is I guess somebody who has been trained in a particular skill and earns a living through using that skill. However there are more professional actors that cannot earn a living because there is not enough jobs to go around and many will end up undertaking a day job and acting where they can in order to keep their hand in and hopefully attract an agent. 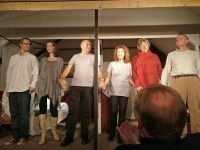 So how do professionals and am dram actors compare and what do both professional actors and am dram actors get out of doing it? Speaking from personal experience and having heard it said from the professionals, there is a huge rush from performing on stage. Some have compared it to doing an extreme sport. There is nothing like the raw excitement of performance and the kick you get from it. Back stage the adrenaline can be cut with a knife and is as strong as the feeling you can get jumping from a plane. Standing in the wings with 30 seconds before you walk on stage is as close as you can get to feeling alive as many other far more dangerous hobbies and professions and the after-performance rush makes everyone act like children again. I suppose the only difference is that ‘professionals’ get paid for doing it. 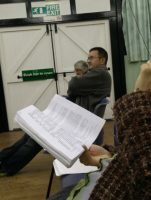 Learning lines is the same for both am dram and professionals too. There is no magic trick to it only pure hard graft. To get to a point where you are performance ready for a one and a half hour play you usually rehearse for about 12 weeks before hand, at 2 nights a week totaling 4 hours on stage per week which totals 48 hours of rehearsal and stage production. In addition, you can average an hour a day learning your lines in between rehearsals which adds to a total of an extra 5 hours a week making a total of 60 hours further learning. So for a one and a half hour show to be performed there is on average a total of 108 hours hard graft from each actor. Whilst professionals are being paid to perform and perform well, there is certainly a similar pressure felt by am dram actors. You wish to know your lines for your own personal pride as well as not to let down your fellow cast. Having to be prompted on stage can be taken very personally with the thought not leaving you until the next performance when you get it right. Giving your fellow actor the wrong cue can be disastrous as well. I remember a recent play where due to a wrong cue, we jumped ahead a couple of pages and finished the play 10 minutes earlier than planned! The audience never knew but we did! Now for professionals we have an impression that they have their own luxury suite bigger than my living room, with mirrors with lights around the edge, flowers and chocolates, good luck cards and a professional makeup artist and dresser. Now undoubtedly for those top West End stars this is probably pretty close to the truth but the average actor, on tour with his show it is probably quite similar to am Dram. You see in Am dram you tend to make do with the rooms to the side of the hall or ever at the back of the stage. You cannot perform am dram and have any inhibitions about getting changed in front of 7 others in a room not much bigger than the average porch with your own personal space about the size of an A4 piece of paper. You just get on with it. Privacy is respected as much as we can but normally we are so focused on the show we just don’t care! Professionals usually don’t have to worry about their costumes as they have them fitted and supplied for them. They just turn up and put them on! For am dram you are usually charged with finding your own costume based upon the director’s recommendations. Imagination is everything and it is where charity shops come into their own. You can spend money buying what you need but you are all aware that whatever you spend comes off the profits for what will be a small production in a village hall that will run for around 4 nights in from of an audience of 70ish. Props are usually sourced from what cast members have at home and you can usually find everything you need the average production even if a member of the cast has to do without there sofa for two weeks. Professionals usually just act. Am dram actors have many more tasks to perform including helping with the set, selling tickets, putting raffle prizes together, setting up the hall for the performance and cleaning the hall after a performance, production posters and advertising as well as many other activities. There is a real community spirit with am dram. Can am dram lead to becoming a professional actor? Dame Judi Dench – got her start as an amateur actress, aged 16, taking part in the 1951 revival of the York Mystery Plays, a work she would go on to take part in several times, eventually playing the Virgin Mary. Brenda Blethyn – worked as a secretary for ten years before getting into the world of theatre – her first ever on-stage part with the Euston Players, the British Rail am-dram group. She was asked to join the production at the last minute when working as a secretary for British Rail, having only previously acted in school productions. Am-dram got her hooked. Sir Ian McKellen – began his long career with amateur performances at the Bolton Little Theatre, before moving on to repertory and professional theatre. Sir Anthony Hopkins – Sir Anthony never thought he’d be an actor, but described to the Daily Mail: “One day in 1947 I found myself in an amateur dramatics class at the local YMCA. I thought to myself: “What the hell am I doing here?” I had no interest in acting, no idea of what I was going to do in life, except probably follow my dad into his bakery….but I tried acting, liked it, and stuck with it. I saw it as the way I would keep that promise to myself of getting back at those who had made my school life a misery”. 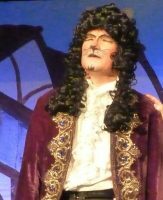 So my conclusion is that apart from a few minor things the world of professional acting and am dram are pretty similar and those who love it dearly can, with the right motivation, skill and dare I say luck can make it a profession. However for most of us we are happy to be part of a community group who put on shows to entertain the locals and have great fun doing it. The closest thing to an extreme sport I am happy to pursue.